A devoted lottery player won an over half-million-dollar prize in Saturday’s Powerball drawing with a ticket bought in the Park West section of San Diego, state lottery officials said Tuesday. 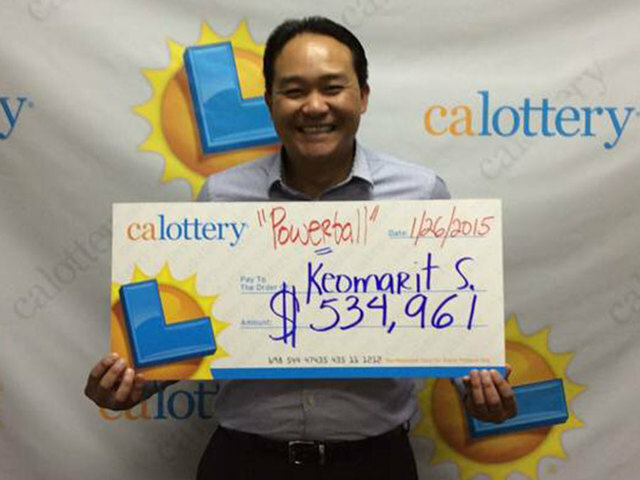 Keomarit Sengsavang told lottery officials he plays all the draw games, and it paid off when he matched five numbers to win nearly $535,000. He matched the winning numbers of 16, 19, 20, 29 and 33 with a ticket purchased at the 7-Eleven at 430 Spruce St., but missed the Powerball number of 10. A ticket bought in Sacramento also had five numbers minus the Powerball number, so that player split the $1-million pot with Sengsavang, according to the lottery. Meanwhile, the jackpot in the Powerball game is up to $261 million for Wednesday’s drawing.